Pat studied silversmithing at the University of Ulster and at the London Jewellery School. 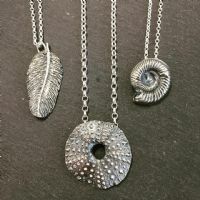 Her jewellery range is made from silver clay; an exciting and versatile recycled material that is .999 pure silver. She is inspired by nature and gets much of her inspiration from the countryside around Slieve Croob. Textures taken directly from organic material such as pods, twigs, bark and seashells can be seen in her designs.